Take TX 71 west about seven miles past the Pedernales River. Turn right on Spur 191 at the Exxon station (it really sneaks up on you) and go about one mile. The road curves sharply to the left and you'll see a sign and driveway on your right just after you complete the curve. Turn right at the red arrow and sign for Krause Springs, then stay left at the fork in the road. It's 34 miles west of Austin. As you approach Krause Springs, you travel down a dirt road through a meadow full of pecan trees, wildflowers, and peaceful cows. A volleyball net and grassy areas wait for someone to use them. Then you see foreboding signs about signing liability releases and surveillance cameras. Don't be put off by these warnings. 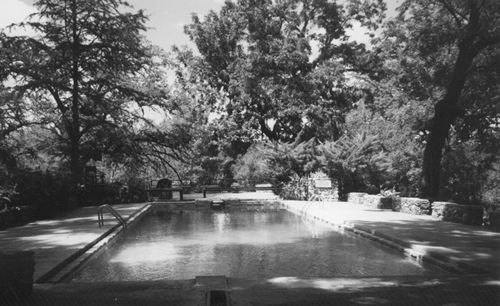 Elton and Jane Krause own and operate Krause Springs, which is on the National Historical Register as an undisturbed midden, or Indian burial ground. Elton Krause used to live in Austin until he retired from the Austin American Statesman. The Krauses bought the land, which had been in the family for two generations, from an aunt in the 1950s. The aunt kept a hog farm there on 115 acres. The first thing Elton did was to remove the hog pens. Then he built the swimming pool, doing 90% of it himself. One thing led to another, and the grounds today are filled with his handiwork. He has made all the tables and gazebos by hand and says you can pick out his first table and see the progression of his abilities. Eventually the Krauses opened their land to the public and built up the campgrounds. 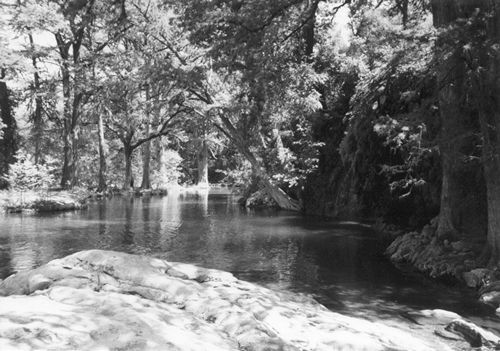 A Texas Monthly article in the 1980s listed it as one of the best swimming holes in Texas. Elton and his sons continually improve and build on the grounds. The landscaping is all done by them, as well as the rock picnic benches. They went with concrete because people would move the wooden tables together in clumps and he'd have to rearrange them each time. Elton officially retired in 1994 but says he's busier now than when he was working for the newspaper. The 70 x 20-foot swimming pool is just below the well, which is the source of the springs. It pumps at a rate of 70 gallons per minute. It is beautifully made with stonework, a diving board, and a concrete patio. Depths range from deep enough for diving to shallow enough to wade in. The water is blue-green, very clean and natural, and it reflects the sky and trees beautifully. The spring trickles out from the well on the shallow end, goes through the pool into canals, flows over a cliff and cascades 25 feet into a waterfall into the lower pool, a natural swimming hole. The waterfall has changed since a portion of the overhang broke off in 1985. The fallen rock is still in the middle of the water. The lower pool is deepest, about eight feet, beneath the falls. There are numerous boulders in the water, so no diving is allowed. Flat limestone rocks have water rushing over them which pools into a great swimming hole with a rope swing, caves, and beautiful, mossy cliffs. To get down to the swimming hole, there is a new set of wide limestone flagstones, a great improvement over the old, rickety, steep stairs. Krause Springs is so quiet and still, you can hear the birds, crickets and cicadas chirping. When I visited on a Friday, there were only five other people there. It is easy to get spoiled by having it all to yourself, and it is so intimate that it feels full when just a handful of people are around. The giant wind chimes, built in Austin, are some of the largest in the country. They sound like cathedral bells and resonate all over the grounds. Lush, green, tropical plants like taro and elephant ears are growing all over the park. Magnificent trees such as cottonwoods, pecans, cypress, and oaks preside over the park. Some of the cypress trees are estimated to be over 1,000 years old, and the live oaks are 100-200 years old. Dozens of butterflies fly through in the spring and fall migrations. I think Krause Springs has done an admirable job of incorporating man-made elements into the natural world. The result is a beautiful park that is obviously well-loved and cared for. Krause Springs also has camping for those who want to spend a few days. There are three tiers of campsites with the bottom level backing up against Lake Travis. Boaters can travel up to the boat ramp at the end of Spur 191 and ride to the campground. There are many picnic areas, rest rooms, and grills. Proper swimwear is required. Loud music is prohibited. Elton's policy regarding trash? The sign says it all: My hired hand just quit!